Add preservationists to the list of American interest groups determined to kill clean energy projects. Preservation Magazine published a good piece on the troubling trend in its summer 2011 issue. Along with all of the other concerns I’ve raised about the myriad and all-too-effective campaigns at the grassroots to curtail clean energy development, add this thought. At least in clean energy development the United States has the opportunity to replace scenic vistas with energy sources that don’t pollute and are sustainable. Which is a good thing considering that the conventional energy sources add to climate warming that is damaging the forests and grasslands that form those very same scenic vistas. In my previous work on Smart Growth, the campaigns organized by the Michigan Land Use Institute and our partners were driven in part by one undeniable fact: In every case beautiful landscapes were being replaced by parking lots and big roads and other out-of-scale projects not fit for a new era of energy scarcity, climate change, and diminishing incomes. Moreover, those new projects — Walmarts, Meijers big box stores, fast food, chain motels — drove average wages down, not up. They drained community vitality. The clean energy sector, if it develops any scale at all, will employ high-skill people earning better wages. It fits much more readily into a natural landscape. And it responds to climate change, which I fear could be the most important threat to the nation’s economy and security because of the fury of the storms we’re seeing now. So what are preservationists preserving when they oppose clean energy projects? 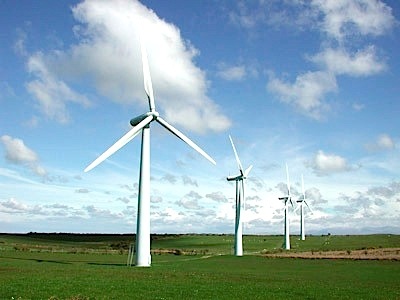 Vistas that are undergoing damage due to the culture’s unyielding reluctance to pursue a cleaner and safer energy path.